By the end of August, Rady Children's Hospital in San Diego is expected to replace three bank guarantees for $228 million in debt, about a year ahead of when the pledges expire. Why now? Because as of March, banks guaranteed roughly $14.8 billion in healthcare bonds with letters of credit—which investors consider akin to insurance—with agreements that must be renewed in 2011, according to Thomson Reuters figures provided by Citigroup. That's up from $4.3 billion in healthcare bonds with guarantees schedule to lapse this year. The figures are based on a sample of 1,112 healthcare bonds backed by letters of credit. "You could wait," said Roger Roux, chief financial officer for Rady Children's. "We wanted to be a full year ahead. The bubble is huge." Not-for-profit hospitals scrambled in 2008 to line up bank credit guarantees as they sought to refinance auction rate bonds that no investor would buy as the credit crisis emerged. Banks set more demanding terms and fees for the cash and credit guarantees and many required borrowers to renew the backing, which typically expires after a few years. For many, including Rady Children's, that's 2011. "The reality is the bubble is now," said Andrew Majka, a partner and chief operating officer at healthcare financial advisory firm Kaufman, Hall & Associates. Hospitals during the past year have renewed credit backing set to expire in 2001 or have moved to take advantage of stable markets to exit the bonds for alternative financing without guarantees, such as fixed-interest long-term bonds or direct, short-term loans from banks. Few are waiting until next year, he said. Banks appear to have capacity for renewals, but he cautioned that conditions could change quickly. 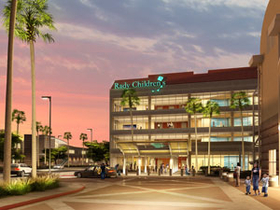 Rady Children's found three banks in 2008 to back bonds issued in the two years before the crisis to finance a new four-story, 154-bed acute-care pavilion, seismic retrofitting and information technology, among other capital projects. Roux said he did not anticipate further bank distress that would make letters of credit harder to come by, but nonetheless, as the hospital renews its bank guarantees, it will hedge against the risk of any one bank failure or market dislocation in any given year, he said. He said Rady Children's will further diversify the banks backing its bonds to four from three and stagger the length of agreements across five years to avoid renewing all the deals at once. "With all the risks and uncertainty we have to deal with, why leave one out there?" he asked.